Are Your Kids Doing Too Much? You are here: Home / family / Are Your Kids Doing Too Much? Are Your Kids Involved In Too Many Activities? Oh yes, you shaped me first inside, then out; you formed me in my mother’s womb. I thank you, High God-you’re breathtaking! Body and soul, I am marvelously made! I worship in adoration-what a creation! You know me inside and out, you know every bone in my body. You know exactly how I was made, bit by bit, how I was sculpted from nothing into something. Like an open book, you watched me grow from conception to birth; all the stages of my life were spread out before you, the days of my life all prepared before I’d even lived one day. Let’s talk children and organized activities. 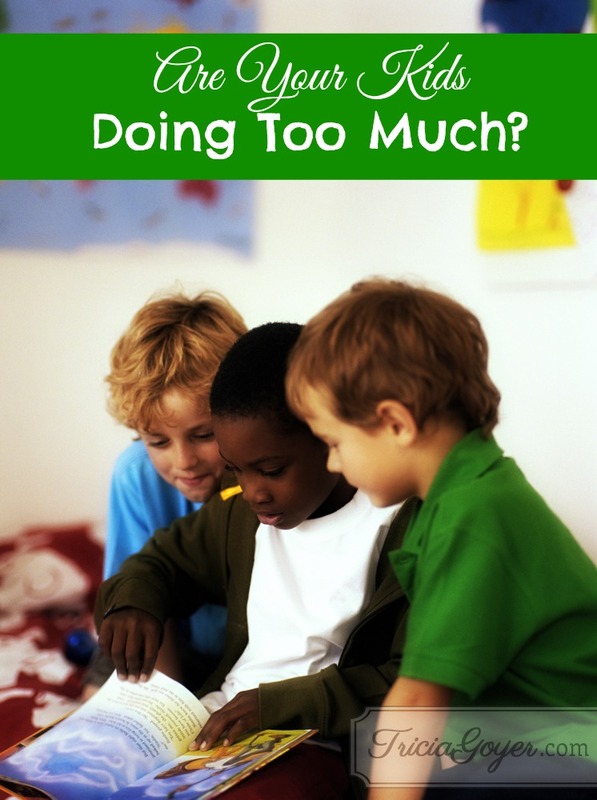 How much is too much and which ones are right for your children? Who could need us more, but our children? Who could be more powerless than our children? They need us and trust us to do right by them. In our hearts we truly want our children to have the best of everything. The problem arises when what we think is “best” for our children is different from what their Maker designed. My two oldest children love books and movies, drama, giving speeches, and music. Looking back, I can clearly see how many years I wasted trying to make them participate in the activities all the other kids were doing. My youngest son makes up creative stories, and then he and his friends act out these adventures with their Beanie Babies. How sad it makes me now to think of those countless hours he spent mindlessly maneuvering around the basketball court, following coaches orders. I forced him to sign up-”for socialization and exercise,” I told myself. I realize now he could have received both by running around the front yard with his friends, leading them on fanciful adventures. In forming our children, God did not create empty vessels, making it the parent’s job to fill them, to form their personalities, and to insert creativity or skill into their brain. Rather, God designed our children and turned them over to us to mold into the shape He’s already crafted. We need to become students of our children and discover their unique shapes. We also need to give them time to be children and not fill up every spare moment with planned activities. Why am I signing my child up for this activity? Am I doing it so my child won’t be left out? Have I asked God His thoughts? Does this activity fit in with my child’s natural talents? Does this activity accomplish peace in our household? Tricia, I am passionate about this issue! My husband and I are very intentionally choosing to only allow our kids to opt into one activity outside school per week. For our boys this is being part of the scouts and my daughter attends dancing classes. Our kids spend a lot of time outside school playing imaginative games, going for family walks and being creative (my eldest son is an avid artist!). However, there is a lot of pressure on us as most of my kids’ friends do organised activities almost every night. It’s hard because culture makes us think that this is good for our kids and the way family life should be run. I love this post and hope it encourages and blesses many families. I’m off to download Balanced now! It was hard for me to let go of all our activities, but I felt led by God to put more space in our life. I’m so thankful for listening to Him. I don’t miss the rat race! That’s so true! Even if we get our kids to slow down, everyone else is running! Tricia… this is such an important article. I’m speaking to a MOP group soon and this is the very topic we are discussing. Somehow we worry we are not “providing enough” and decide the way to do that is to jump on the proverbial wheel. Thanks!